One Perfect Little Miracle: But What If I Haven't Received The First Catalog? This catalog came in the mail yesterday, addressed to me. I don't recall ever seeing this one before but, apparently, this is my Final Catalog! Okay. 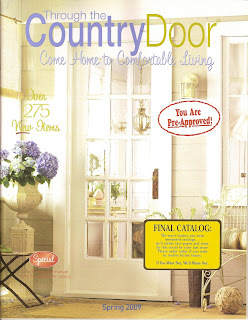 It is a nice catalog, full of country treasures to decorate and clutter your home. Did I just say that? The best part is, that on a few pages, they have very nicely printed recipes. Obviously planted to make sure you read to the very end without casting it aside like every other catalog you receive. Why don't they ever send a "last one"? And so, doing what every other self-respecting blogger would do, I tore out the recipes and scanned them for you. I think sharing is a good thing. 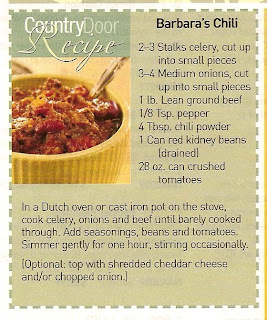 I don't know who Barbara is, but her chili sounds delicious and I think I will make it for dinner on Friday. And we will be exercising our options. 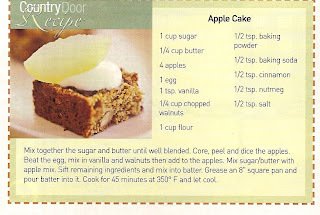 How can one resist Apple Cake, with its warm spices and bits of apple laced throughout? Mine will be sans nuts. We have enough in our house already. Lemon? Butter? Do I need to say anything else? Savory waffles sound very intriguing. How about making them for a bed on which to ladle Chicken a la King? Mmmmmm. Classic, minty Grasshopper Pie. Without legs. 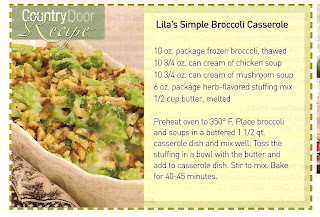 Broccoli Casserole- perfect for a potluck. I cannot wait for summer to serve this on the back porch, in tall, icy glasses with a sprig of mint. It's a Southern thing. 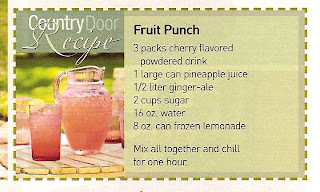 Well, there you go, a few new recipes to try, courtesy of Through the Country Door. I doubt very much I will be able to do this again as this is my last catalog. make sure you invite me when you make the fruit punch. And I'm making the waffles soon, and yes I too will top them with something chicken & creamy. 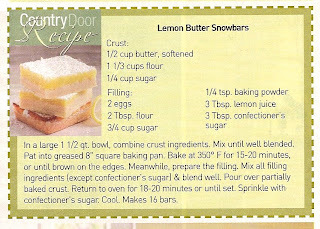 I'm after those Lemon Butter Snowbars! Thanks for sharing these recipes. Wonder where they got your name and address....someone's ratted you out, eh? isn't this the same thing as "sharing" music? i mean, c'mon. I've gotten catalogs like that- "Last one" "Better Hurry!" I think they think if they place a sense of urgency on it- we will think "Oh my! I must order something... NOW!" 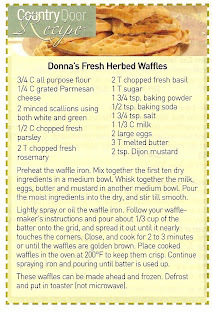 Here's another waffle recipe for you. I love having breakfast for dinner occasionally and have a tiny little waffle maker. Just make up your standard waffle batter and then add a good handful of grated cheddar cheese (or any other cheese you like). Saute up a little sausage (I don't much care for sausage but I love the homemade chicken sausage links that Whole Foods sells with spinach, feta, and black olives in them. I just slit the links, squeeze it out into the pan, and stir fry it. Anyway, add the cooked and drained sausage to the batter. Then make your waffles. YUMMY! Good with sour cream on top or real maple syrup.